Allegro Pearland Academy of Music is the largest and most acclaimed music school in Pearland, Texas. Our goal is to provide an atmosphere where technical skill and artistic gifts can flourish and to foster confidence in students of all ages through exceptional music education. With our world-class music teachers, innovative student achievement recognition system and top-notch facility, we help students to develop a life-long skill and passion for music. Since we opened our doors in 2011 we have taught thousands of students. Located off Hwy 288 in west Pearland, we are only minutes away from students in Pearland, Manvel, Rosharon, Alvin, and Houston. Since 2011 we have helped thousands of students begin and continue on their musical journey. 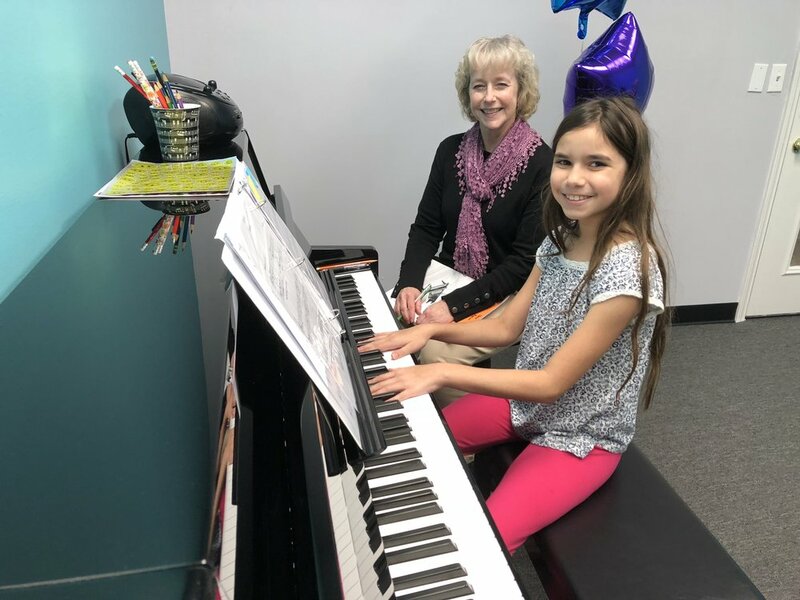 We offer private lessons in piano, guitar, voice, violin, cello, ukulele, viola, drums, bagpipes, trumpet, special needs, and group string lessons. We know you are busy and it can be very hard to find a reliable music teacher. That's why we go above and beyond to find the BEST music teachers in Pearland--so you don't have to! While you're researching the best school for you, consider the benefits of becoming an Allegro Pearland Academy of Music student and find out why we are your number one choice for music lessons! 1. Lessons for piano, guitar, voice, violin, cello, ukulele, viola, drums, bagpipes, trumpet, special needs, and group string lessons in your home or in our studio. Save time with our in-home lessons or enroll family members to take lessons at our studio in Pearland. We welcome all beginners and all levels--no matter what your age! 2. "Voted Best Music Lessons/Studio in Pearland 2016 & 2017" by Living Magazine Readers' Choice. 2017 Bravo Award recipient by Pearland Mayor Tom Reid and Pearland Alliance for Arts and Culture. We have 30 music teachers, who we've handpicked so your student can have the right personality and the right teaching style that works for them. Allegro offers a highly qualified teaching faculty. Our instructors have performed at Carnegie Hall, with Houston Symphony, Houston Grand Opera, The Texas Medical Center Orchestra, Da Camera Houston and throughout Europe. Our award winning faculty have many years of teaching experience and most importantly a passion for teaching. Being a musician doesn't automatically make you a teacher. That's why we search for those who are best qualified for mentoring our music students. We search the entire Pearland and Houston areas for the top teachers, who embody the high values of Allegro Pearland Academy of Music. Most importantly, our instructors strive to relate their teaching to each individual student's learning style. In addition to their teaching credentials, our teachers have warm personalities, are extremely friendly, and strive to get to know each student and their parent on a personal level. Studio lesson times available 7 days a week! We serve over 350 students! Visit our testimonial page to see what our students are saying. We have a proven track record of offering quality piano, guitar, voice, violin, cello, ukulele, viola, drums, bagpipes, trumpet, special needs, and group lessons in Pearland TX, year round. Our full time mission is teaching music lessons, trusted by hundreds of families for 8 years. 6. A comfortable waiting room for parents. With over 2,000 square feet, we have the most spacious and parent friendly waiting area in Pearland. Instead of waiting in a music retail store showroom, or a cramped hallway, our clients enjoy a spacious, professional parent's lounge with comfortable chairs and kids toys. We also provide large observation windows for every room so that you can watch your child's lesson while you wait. Or if you prefer, you can sit in on the lessons at anytime. Every parent just wants to know how their child is doing and if they are really progressing. The best way for a parent to understand if their investment in lessons is really worth it is to have their child participate in a recital. Many of our students choose to perform in our biannual recitals. Our recital location has a grand piano, so piano students are not playing on just a keyboard. Our sound system ensures a quality experience for all! Unlike other schools, parents never have to pay admission or any related fees for these recitals. 8. Conveniently located at 1801 Country Place Parkway #107 Pearland OR Lessons in YOUR home! Due to its central location, our school is convenient and draws students from Pearland, Houston, Manvel, Alvin, Meridiana, Rosharon, and Shadow Creek Ranch, TX. We are easy to find, right off 288, with shopping and restaurants close by. We are the only music school that offers student discounts, which saves you money all throughout the year. We offer sibling/family discounts to save families time and money! We are the only music school that offers a picture day for their students! Each spring we host a picture day with a professional photographer and take professional photos of your student with their instrument. We want to celebrate your music and share that memory through pictures. 11. Awards to celebrate achievement. Each student will receive an award for their skill level within their division at the spring recitals. The divisions are Andante Division, Allegretto Division. and Presto Division. Additional awards presented are Student of the Year, Most Improved Student, Emerging Composer, and Theory Master. Certificates are also awarded throughout the year as students complete each book level. Students may also choose to advance through the Royal Schools of Music Exam Program offered at Allegro. Certificates earned through ABRSM can lead to college scholarships. 13. Lunch time lessons available for home schoolers, retirees, college students, and working professionals. Since we are the largest school in Pearland, TX, we are able to be a "full service" music school. This allows us to offer lessons between 11:00am-2:00pm. If you are a homeschool parent, retiree, college student, or working professional who has a flexible schedule, take advantage of our lunch time lesson spots.